Closing last page the kids have to go sleeping. It is time to remember all of the previous pages. I collected every two of them and stitch together. I have added satin ribbons on the first and last pages to keep the book closed . 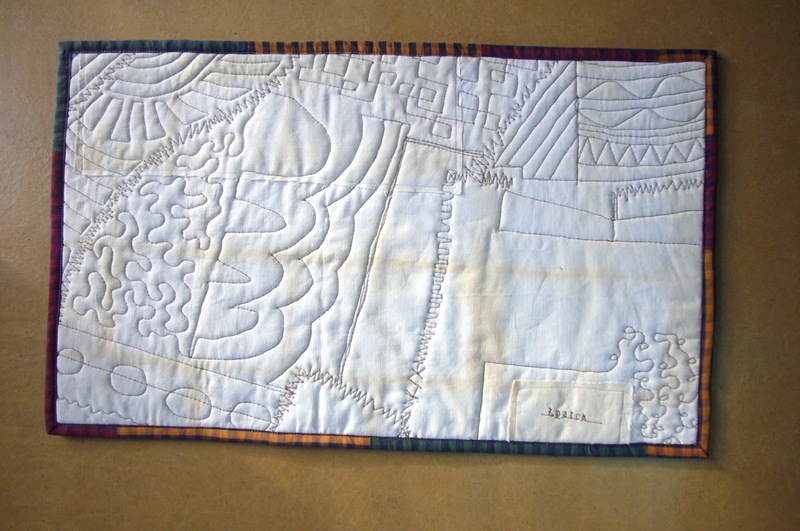 The first and the last one are binding as a quilt at all three sides except the "back" side. Others are stitched pillowcase method, turned over and ironed well. Then cut a rectangle of thick fabric or eco leather and stitch pages one by one. Come on folks - the next two pages of the quiet book are pretty amazing. Learning colors, practice grab and tear out activity, how to press stopper button. Follow these easy instructions to sew the balloons. 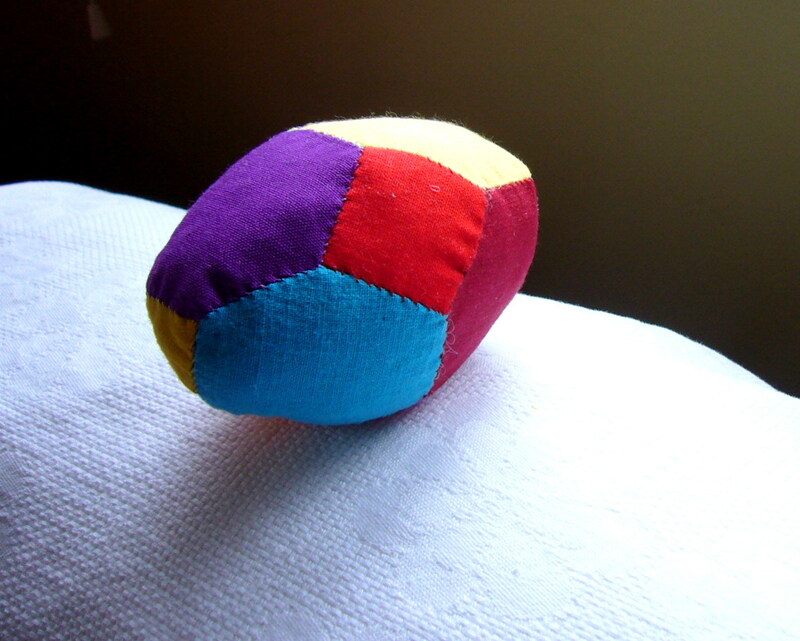 Cut a felt balloon and stitch a square VELCRO tape on it. 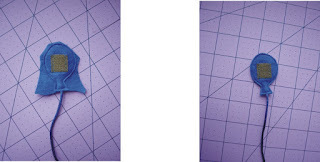 Cut a piece of felt the same color. I have an irregular piece, but you should cur a rectangular one. 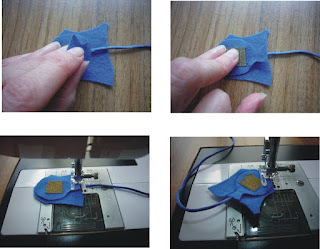 Place the cord between two felt pieces as shown on the picture keep in mind to align the ends. 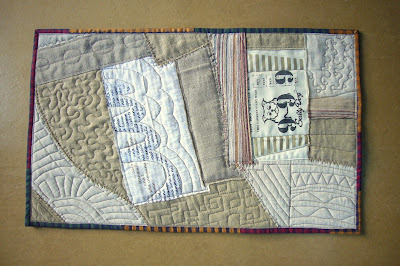 After stitching cut around carefully. 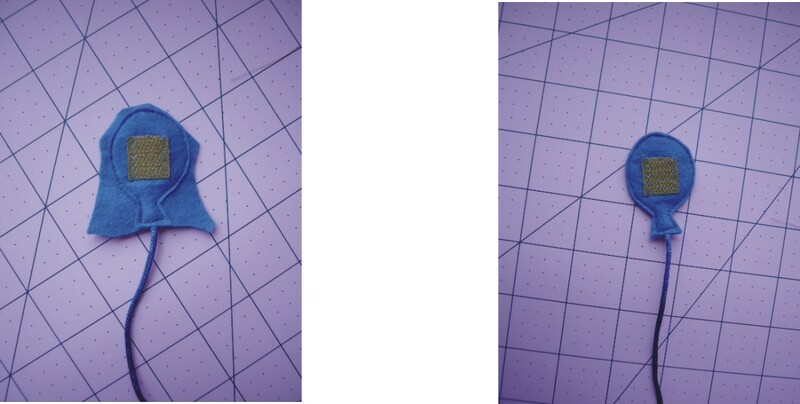 Make the same balloons with opposite piece of VELCRO tape and applique them on a fabric. I have added two birds in the sky. The second ends of the balloons are firmly stitched in the basket. I was so-o-o-o-o happy when found 4 color ladybirds and flowers and much more happy when seen this fabric. Stitch firmly two of the flowers. Thread a color cord and knot. Repeat the same with other two flowers and ladybirds. This is the final look of the page. Some apple on a tree, an apple in the basket. When an apple become ripe it has to "go" to the basket. 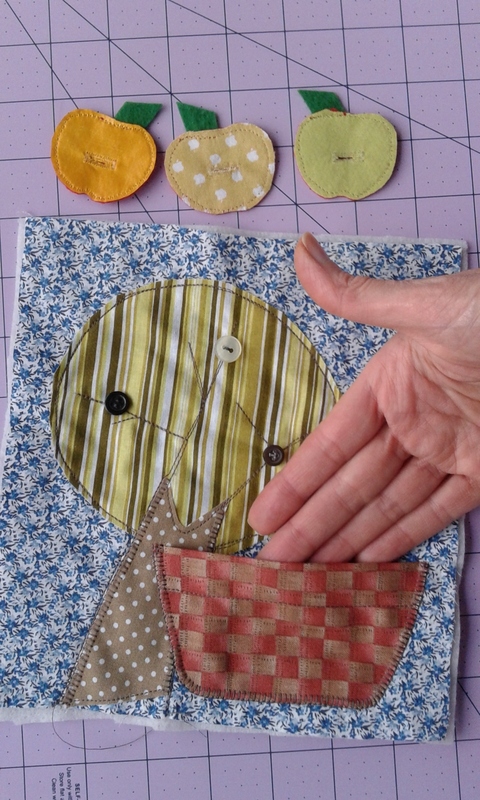 I have appliqued a circle from striped fabric and then cut a strip form white dotted blown fabric. One end was uneven but I decided not to cut and it looks like the beginning of branches. 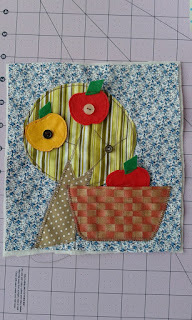 Then stitched branches by brown thread and voila! perfect tree appeared. The green felt leaves were put between 2 layers - felt and fabric. 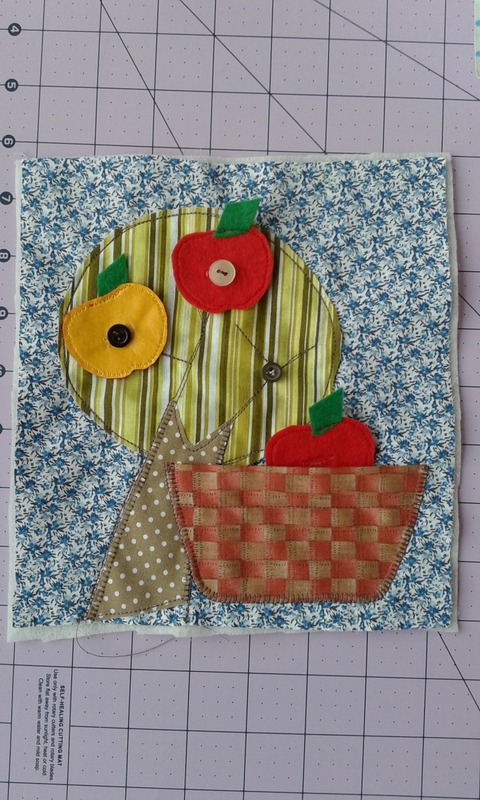 The basket is appliqued like a pocket to collect apples. Let me introduced another page from my quiet book - the rain. A cloud in the sky, a thunderclap that could be pull out. Grass, a leaf and a ladybird crawling among them. It can't rain all the time - there is a rainbow in the sky. As I mentioned in my previous post I was asked to make a quiet textile book for a grandchild of a friend of mine. I promised to sew one, but couldn't realized what a journey began. First three or four hours I started to draw different ideas on a piece of paper. On the next day I visited some crafty shops to buy beads, wooden flowers, butterflies, ladybirds, ribbons, colorful felts etc. First of all is the sun. In my mind the sun is associated with sea. What are the steps to have this result? Prepare a rectangle piece of fabric - about 8 x 9 inches. 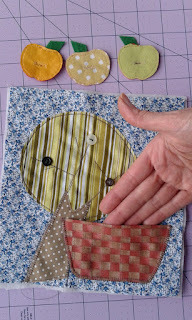 Applique yellow and blue pieces - if you have prints with fishes or sand it would be perfect. I have striped blue fabric. First - cut different strings and ribbons yellow color. Pin them in a circle and stitch firmly. Then cut a yellow felt circle for the sun. If you have zig zag scissors use them. Carefully stitch round the perimeter. I have a small plastic fish and put it on a wire. Add tiny batting and quilt round the sun. Wait for the next page. 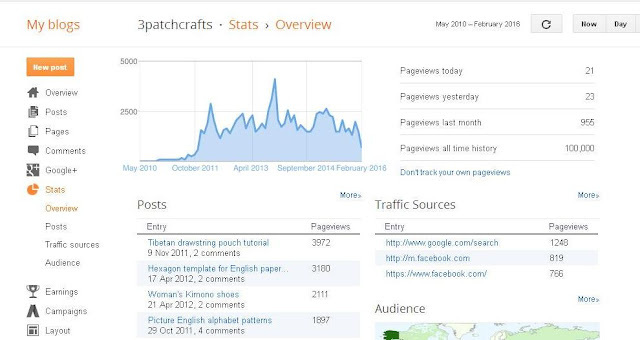 Come here in a couple of days to see more interesting ideas. I have a friend of mine who has a birthday on 29 of February. He needs a special gift. 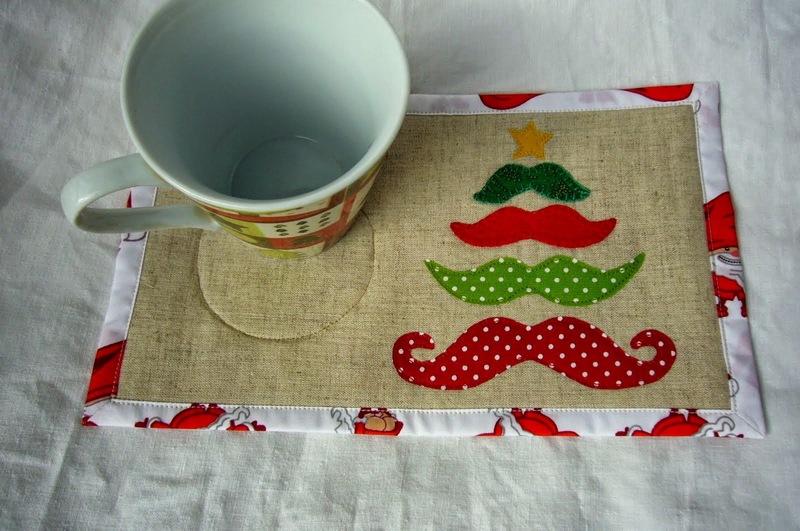 I collect different leftovers and make a mat - long planned as a gift. 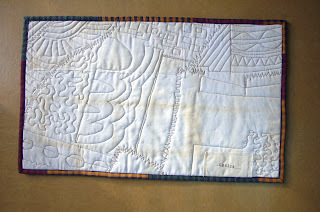 Good for me to practice some quilting stitches. Good news! I am so proud. Last month my blog have hit 100 000 visits. 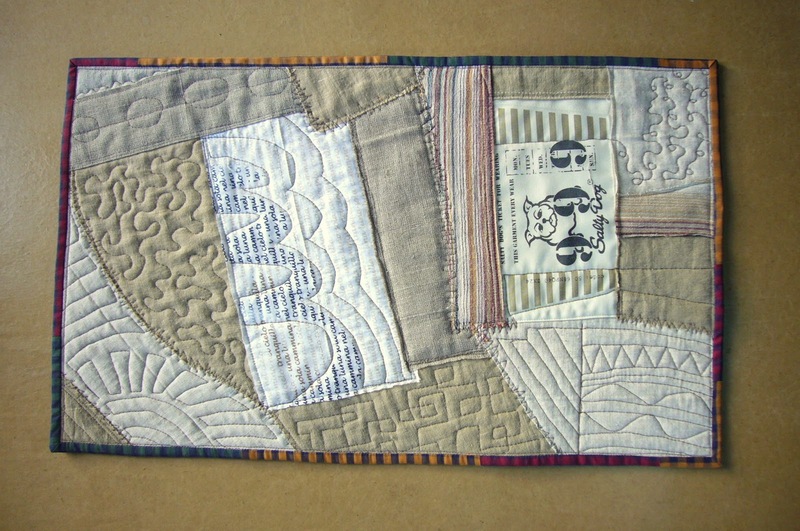 I have neglected writing here lately because of hard sewing to participate in a exhibition. Now I am amusing myself by creating a quiet book for first grandchild of a friend of mine. It is so funny to combine different colors and ideas about kids' education - recognizing colors, tactile touching, cultivate tiny movement and catch ability . I have made two sheets of the book, but hope next week I will finish and can show it to you. You are welcome to use them! Easter is round the corner - try to make Easter egg by using English paper piecing .